Pack veggies and cheese into this side dish or appetizer recipe inspired by everyone's favorite spinach artichoke dip for a gluten free snack that's fun to dip. Put a new spin on the pizza night pairing of pizza and bread sticks with this gluten free and veggie packed version that tastes like a favorite cheesy dip. 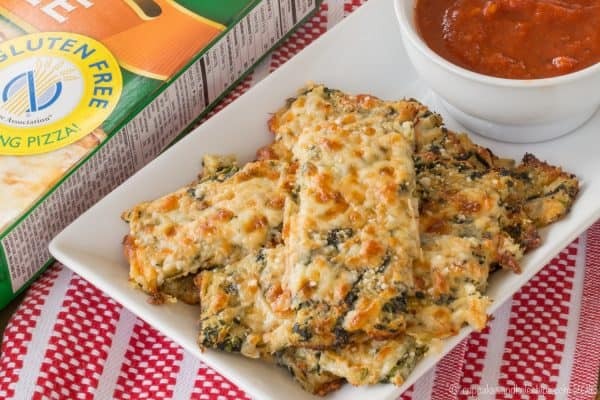 Grab a slice and some of these Spinach Artichoke Cheesy Cauliflower Bread Sticks. Disclosure: This recipe was developed through a sponsored partnership with Freschetta. As always, all opinions are my own. Every evening on my Facebook page, I ask what people are having for dinner. And on Friday, I usually ask who is having pizza. Growing up in a heavily Italian-American area, “Pizza Friday” was a big thing, but I had always wondered if it was just as popular in other places as where I grew up. It seems it is! After a long week when nobody wants to cook, it’s all about stopping at the store to grab a pizza you can just pop in the oven or ordering a pie. My boys would be thrilled to have pizza every Friday. With this mama’s gluten allergy, though, Pizza Friday isn’t as simple as heading out to the local pizzeria, picking up a menu and a phone, or even grabbing a pizza off the grocery store shelves. There just aren’t many gluten free pizza options on the market, and really good gluten free pizza is even harder to find. I do have a couple go-to pizza crust options so that we can make our own, but the joy of Pizza Friday is not having to do any work. Who has the time to wait for dough to rise? Guys, I’m making Spinach Artichoke Cheesy Cauliflower Bread Sticks! I may not always want to make the pizza myself, you know with all of the yeast and kneading and rising and such. But if I can make them happy by serving pizza and my kitchen efforts go toward making sure they get a good dose of vegetables along with that pizza, I am willing to make the sacrifice, even on Pizza Friday. Cauliflower bread sticks are made in a similar way as that cauliflower pizza crust that’s all the rage. Except by cutting it into sticks, you get more crispy edges, plus they are way more fun. 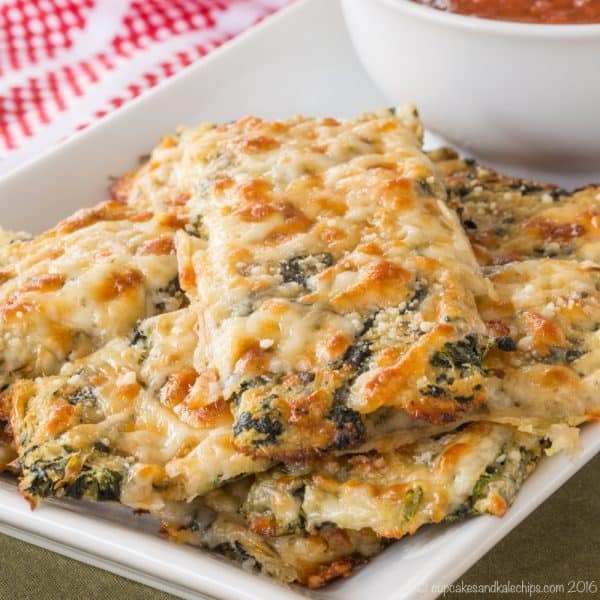 In the past, I kicked them up by making Blue Cheese Cauliflower Cheese Bread Sticks with Buffalo Marinara, but this time I was inspired by that ooey gooey good spinach artichoke dip that everyone loves. The key, though, is taking the time to squeeze out all the excess moisture from the cauliflower, spinach, and artichokes. Once you think you are done squeezing, you should still give it one more good squeeze or two. 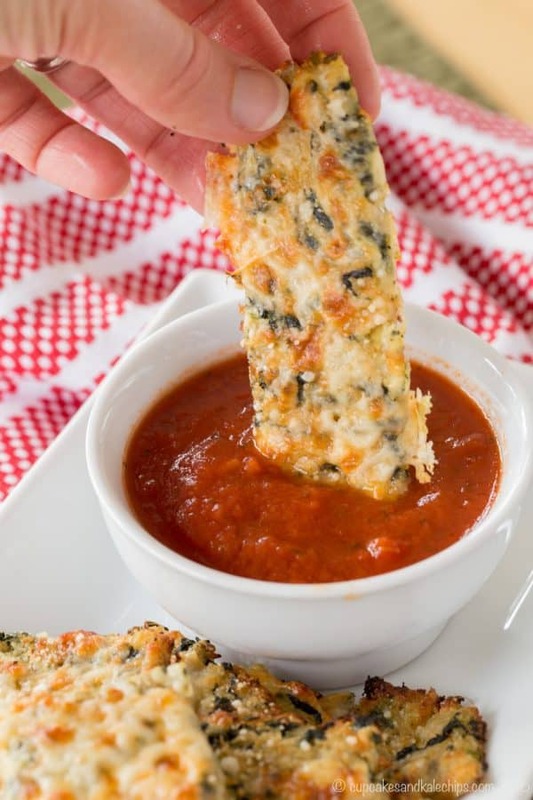 If you do that, and my other little trick of separating the sticks for the last bit of baking, instead of dipping bread into spinach artichoke dip, you’ll have the spinach and artichokes right in the sticks, which you can pick up and dunk into some marinara sauce. Once you’ve got the bread sticks on the side, Freschetta makes the pizza part of the meal easy and delicious with their Gluten Free Thin & Crispy Pizza. I am admittedly pretty picky with my gluten free pizza, and I totally enjoyed a couple slices of the 4 Cheese Medley Pizza. The kids had their share too, and immediately began asking when they could try the Signature Pepperoni Pizza. I can tell you, I’ll be keeping a few of these pizzas on hand for a quick and tasty Pizza Friday during this busy time of year. Those with celiac disease can also rest assured that these pizzas were made in a completely wheat-free facility, and has been certified by the Celiac Support Association. When you have to avoid gluten, there is nothing better than enjoying a favorite food that tastes great and having the confidence that it is safe to eat! Are you ready to have your own gluten free pizza night? Freschetta is going to help you out with that by giving one lucky winner five coupons for a free Freschetta pizza AND a $50 VISA Gift Card! You have till 11:59 pm on Monday, October 10th to enter. Winner will be contacted my email and must respond within 48 hours or another winner will be selected. Good luck! Update: Giveaway has ended and entry form has been removed from this post. 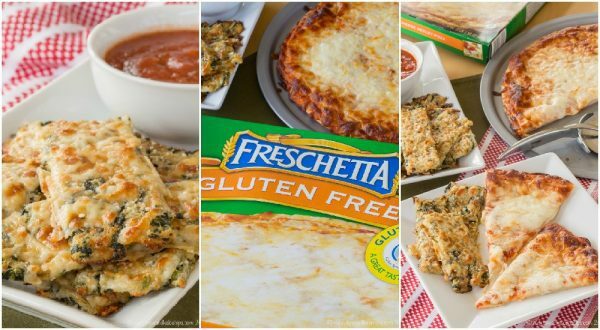 Whether you are having a Pizza Friday in your house, or maybe looking for some game day eats for this weekend, pop some Freschetta Gluten Free Thin & Crispy Pizza in the oven, and whip up a batch (or three) of Spinach Artichoke Cheesy Cauliflower Bread Sticks! Remove the outer leaves from the cauliflower and cut it into florets. Place in a food processor and pulse until it is the consistency of rice. Transfer the cauliflower to a microwave-safe bowl, cover with a lid or plastic wrap, and cook in the microwave for 10 minutes. You can also steam the cauliflower. Allow the cauliflower to cool until you can handle it. Mix in the spinach and chopped artichoke hearts, then transfer to a kitchen towel or cheesecloth and squeeze out as much liquid as possible. This step is important, so be sure to get out all of the liquid. Place the cauliflower mixture in a bowl and add the egg, Monterey Jack cheese, salt and pepper. Stir to combine. Transfer the mixture to the prepared baking sheet and spread into a rectangle about 8 x 12 inches and ¼-inch thick. Bake in the oven 15-18 minutes until firm and set in the middle and browned on the edges. Remove the baking sheet from the oven, top with mozzarella and parmesan cheese. Cut into 16 sticks and separate the sticks. Return the pan to the oven and and bake another 8-10 minutes until cheese is melted and edges are browned. Adapted from my recipe for Blue Cheese Cauliflower Cheesy Bread Sticks, which is based on a recipe from The Foodie Physician. 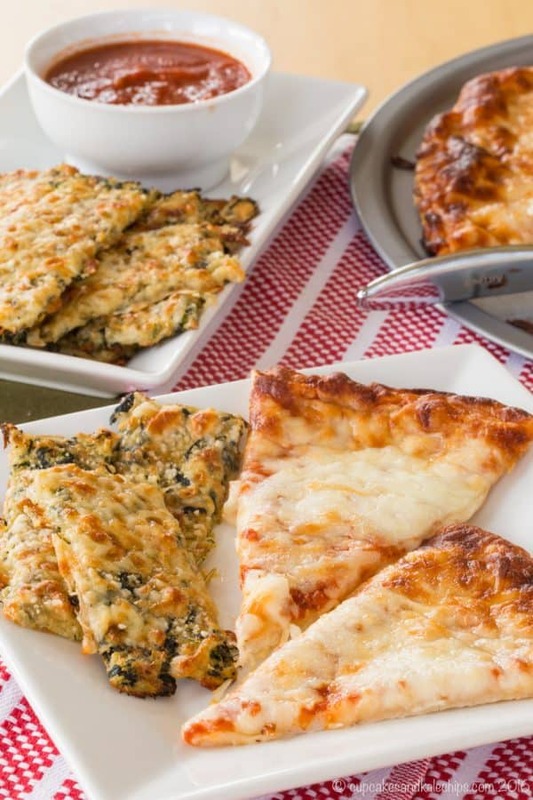 Enjoy this Spinach Artichoke Cheesy Cauliflower Bread Sticks recipe! Roughly how many cups of riced cauliflower should you end up with? The cauliflower heads here are so varied in size and I don’t have a scale to weigh 2 pounds. Thanks. It’s about 2-3 cups riced cauliflower, though I’d err on the lower end of that. I would serve a healthy salad with this delicious pizza. I love pizza and salad! 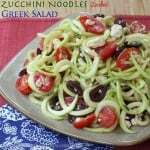 My family likes pasta salad with veggies, cheese and pepperoni with pizza. Oh those cauliflower bread sticks look amazing! So neat without flour! I was diagnosed with celiac about 10 years ago now, and I really miss having breadsticks with my pizza. I have to try these for me! I have not tried the Freschetta pizza yet…that does look so good! I have to pick one up and try it! I miss having a oven baked pizza when I make a regular one for the rest of the family! I would serve a nice big ceasar salad! Yum. thanks for the chance. I serve grilled vegetables and garlic bread. I would serve this Pizza with a Large Salad to balance out the meal. The Cauliflower breadsticks look AWESOME! Salad is always a good option! We do pizza a lot during football season and my family lies to have fried buffalo chicken bites with their pizza. After looking at your facebook post on brie cheese dips we are going to be trying some of those too. I’d make a house salad with a tangy dressing. I will serve a fresh side salad and garlic bread. YUM! These look amazing! I would definitely serve these with pizza. I would prefer these to regular breadsticks that have all the carbs. These look so much healthier. 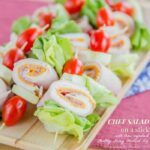 My kids would love this – and so easy for weeknight meals! I love spinach and artichoke… cauliflower too. I swear this is my dream recipe. I will be making this asap! Definately making these breadsticks to serve with it! Yum! These look delicious! Spinach + artichoke + cheese = heaven! My boys would go crazy for these! Spinach and artichoke! Sign me up!